The site has many names( Bassai/Bassae/Vasses) which stands for "little valleys", the name of this area. 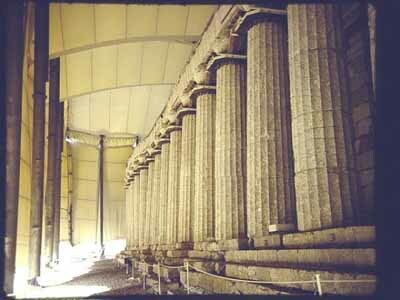 This famous temple is dedicated to Apollo, because the inhabitants worshipped him in case of war or illness. It was built from 420 to 400 BC in the lonely heights of the Arcadian mountains. The originality of this monument lies in its internal design. A 31 meter long frieze encircled the inside on all four sides.